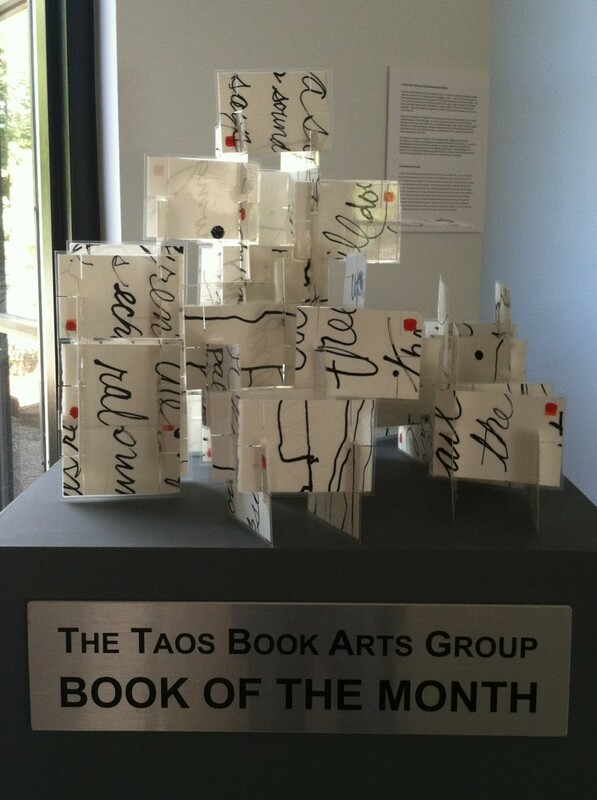 I am so pleased my book “House of Cards: Plaza Blanca” was chosen to be the Book of the Month, to be displayed in the Taos Community Auditorium, September 29-November 20, 2014. The Book of the Month is a collaboration between the Taos Center for the Arts and the Taos Book Arts Group. Each month a new work of art is on display in the Encore Gallery. Artists in the Book Arts Group experiment with a wide range of readily available materials and simple techniques to develop creative narratives. Sometimes they bear little resemblance to the codex book form that is most familiar to all of us, yet they share with all books sequence and narrative. My book is titled “Plaza Blanca: House of Cards”. It is a piece about the White Place, or Plaza Blanca, in Abiquiu and is based on a child’s game, “A House of Cards.” I see it in relation to the White Place and the way it is always eroding and changing, how portions of the cliff fall down, rocks weather, and water carves out the arroyos. It is never the same from one season to the next. I started with two large ink drawings done on site at Plaza Blanca. I then wrote the text of a poem entitled ‘Echo Amphitheater’ by Renee Gregorio on the back. I cut the drawings into 72 cards, ran them through a laminator and then cut slots in them. They can be assembled in an infinite number of ways. There is no right or wrong structure. deep red on pale orange, spidery dried blood. the earth’s boundaries raw, untenable. All voice is an echo, all sound a stoney return. the obscure danger behind a siren’s wail. Short, sharp sounds echo best, the sign says. A leaf’s softer turning doesn’t reverberate. Here’s a stage for word’s re-making. piercing sounds, the brief masks of voice. "House of Cards: Plaza Blanca"
This entry was posted in Artists' Books, Sculpture and tagged artist's books, black and white, house of cards, line drawing, Plaza Blanca Abiquiu NM, sculptural book, Taos Book Arts Group, weathering. Bookmark the permalink.